WASHINGTON, D.C. – August. 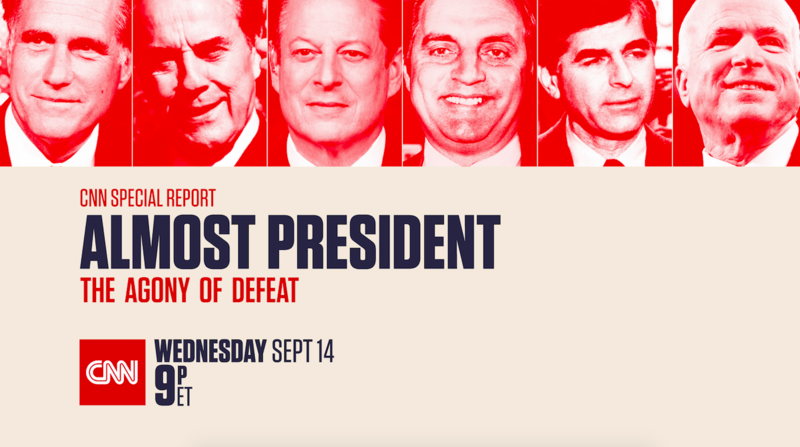 23, 2016 – In Almost President, CNN Chief Political Analyst Gloria Borger tells a story that has not been told before: four men, sharing their accounts of how they lived through the most public failure in American life. Mitt Romney, John McCain, Michael Dukakis, and Walter Mondale detail their journeys – from years of reaching the pinnacle of American politics, their moments of greatest triumph, all the way to the moment that each man knew – in one night – it was all over. In a series of interviews that took place over the last three years, each candidate analyzes his own mistakes, the impact on their families, the pain of knowing they will always be branded as ‘almost president.’ By and large, they’re still not over it, but they would all do it all over again. The documentary also offers the candid views of three top political strategists: James Carville, Mark McKinnon, and Bob Shrum. All three have been on in the inside of these losing campaigns and detail what happens when the vote count isn’t there. Airing in the midst of a heated presidential campaign between democratic nominee Hillary Clinton and republican nominee Donald Trump, the one-hour documentary gives viewers a first-hand look at what happens the day after Election Day – and what awaits either Clinton or Trump after that one night in November when their fate is decided. Liza McGuirk is the Executive Producer.